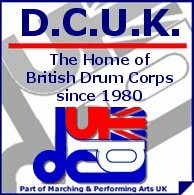 DCUK Contests will be a "Perfect Day"
Towards the end of the 2006 season an attempt was made to try and organise a mass brass performance at DCUK Finals. Unfortunately, due to time constraints, this was not possible but a commitment was made to try again for 2007. DCUK are now pleased to announce that at every contest in the coming season there will be an opportunity for all brass players to perform the Lou Reed classic tune "Perfect Day" using an arrangement by Eoin O'Keeffe. “It would be great for all parties involved to play a single piece together as the majority of musicians in the activity here do not have the opportunity to play in a large hornline regularly, and it can be a very rewarding experience for the younger musicians that are new to the activity” commented Eoin after this arrangement was showcased at the High Brass "Brass Workshop" in October 2006 and DCUK are please to make both the Score and MP3 available to all via the Download Page of this website.